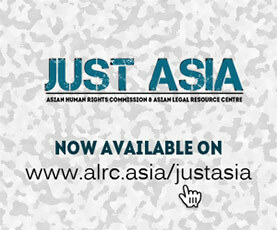 The Asian Human Rights Commission (AHRC) has been informed that another 24 Ahmadiya Pakistani asylum seekers, who are applying for an asylum status in Thailand to escape from religious persecution, are at risk of being deported after they were illegally arrested from their homes in Bangkok on February 20, 2011. The group, which includes children and pregnant women, are presently detained at a police station. The actions taken by the government of Thailand, to deport persons who are at risk of torture, extrajudicial killing and persecution, is a violation of its obligation to international law. ), we have already reported that 85 persons, 17 of whom have already been granted refugee status by the United Nations High Commissioner for Refugees (UNHCR) in Bangkok, have been taken into custody of the immigration detention facilities. They are presently subject to deportation proceedings. The AHRC has already asked the National Human Rights Commission (NHRC) of Thailand to intervene urgently in this case; however, they have taken no action to assist. On 20 February 2011, the Immigration Police in Thailand raided the houses where the 24 Ahmadiya Pakistani asylum seekers are staying in Bangkok. The group is composed of ten children, seven women–two of whom are in advanced stage of pregnancy; and seven men. They are presently detained at Pratumtani Police Station while waiting to be transferred to the Immigration Detention Center. They will be subject to deportation proceedings which are in violation of the principle of non-refoulement, which prohibits the deportation of persons back to their countries of origin where they will be at risk of persecution, torture, and death. At the time of their arrest, the UNHCR in Bangkok had already accepted the application of asylum status of 24 individuals. Under article 3 of the Convention against Torture (CAT), of which Thailand is a State party, they have obligations not to: “expel, return (“refouler”) or extradite a person to another State where there are substantial grounds to believing that he/she would be in danger of being subjected to torture”. The Ahmadis are being prosecuted over a Draconian Ordinance in 1984 in Pakistan, banning the Ahmadis from converting Muslims to their religion, and prohibits them from identifying themselves as Muslims. Therefore, the Ahmadis are being subjected to deportation or extradition proceedings to send them back to Pakistan to face the charges. Several groups of detainees in Thailand are also identified as members of Ammaddiya Muslims who fled such persecution in Pakistan to seek refuge and are endlessly waiting for refugee status from UNHCR. These raids, arbitrary arrests, detention and deportation of all irregular migrants are annually scheduled with joint efforts of Immigration authorities as authorized by the Immigration Act, B.E. 2522. These arrests and detention, however, have already resulted in the congestions of detention facilities. The detention facilities in Thailand often hold prisoners beyond its limit which result in inhumane treatment of prisoners and poor hygiene. In one recent visit it was noted that the detainees are held like “canned fish” and could not even a sit at the same time. Please write to the persons listed below to call for the immediate release of these persons from custody and the respect of their right to seek asylum in Thailand and complete the process that they have begun with the United Nations High Commissioner for Refugees. Please be informed that the AHRC is writing separate letters to the UN Working Group on Arbitrary Detention and the regional human rights office for Southeast Asia concerning these detainees. Number of victims: Twenty four individuals from Pakistan. They are composed of ten children, seven women–two of whom are in advance stage of pregnancy and seven men. Details of their arrests and detention: They were illegally arrested by the Immigration Police Division, Royal Thai Police on February 20, 2011. They are presently held at the Pratumtani Police Station awaiting transfer to the Immigration Detention Center. Justification for deportation & extradition: The victims are Ahmadiya Pakistani, one of the religious minorities in Pakistan. In Pakistan, Ahmadis are being prosecuted for an Ordinance promulgated in 1984 banning Ahmadis from converting Muslims into their religion and prohibits them from identifying themselves as Muslims. The deportation & extradition proceeding is done for them to face the charges in Pakistan. I am writing to express my alarm at information I have received that Thai Immigration Police have taken into custody at least 24 persons of Pakistani Ahmadiya Muslims who have fled to and have been staying in Bangkok for the purpose only of obtaining asylum. The victims were composed of vulnerable persons–women, two of them are pregnant; and children. They are now being detained at the police station mentioned above. According to this information, on 21 February 2011, the Immigration authorities in Thailand have raided the homes at nighttime of where these persons lived in Bangkok. These were done despite them having their application for asylum status granted by the United Nations High Commissioner for Refugees (UNHCR) in Bangkok. Without explaining to them the reason why they are being arrested, they were taken into custody at the Pratumtani Police Station. They are expected to be transferred to the Immigration Detention Center while they are waiting for their deportation proceedings to be completed. I am deeply concerned that the Government of Thailand openly violates its international obligations under the Convention against torture (CAT), Article 3, which prohibits governments to deport or extradite persons to another State where they are at risk of torture, execution or persecution. The probability of these victims, including those the Immigration authorities have arrested in December 2010, to be tortured, persecuted and killed in Pakistan, once deported have already been affirmed by the United Nations High Commissioner for Refugees (OHCHR) who have accepted their application for asylum status. In fact, 17 of those who have been in custody after their arrest in December 2010 have already obtained asylum status. Therefore, those who are seeking asylum, whose applications are still pending, have reason to believe that they would be subject to torture once deported. I urge the Government of Thailand to comply with its obligations under the CAT to refrain from using Immigration laws on victims facing these tremendous difficulties to survive by forcing them back to Pakistan. Also, I am concerned by the overcrowding and poor hygienic conditions of the detention facilities in police stations where these victims are held. According to the report of one person who visited the facility recently, detainees are held like “canned fish”. There was not even enough room for everyone to sit at the same time, let alone to lie down or move about at all. I am appalled to hear that children and pregnant women especially are being held in such circumstances, and I am aware that aside from this group there are other women and children being held in the atrocious conditions at this facility: according to a report by a recent visitor to the detention centre, there are at least five women in advanced stages of pregnancy, from Sri Lanka and Pakistan, locked up there at present. In light of the above, I call for the immediate release of these persons and for them to be allowed to remain in Thailand pending the outcomes of their applications for asylum. I call for appropriate medical treatment to be given to the sick and pregnant among them, and for the concerned authorities to take other measures as necessary for their security and wellbeing. In this regard I draw the attention of the Government of Thailand to comply with its obligations under international laws, particularly under the International Covenant on Civil and Political Rights (ICCPR) and the Convention against Torture (CAT).